On Monday, David’s Bridal filed a voluntary prepackaged Chapter 11 petition in the U.S. Bankruptcy Court in the District of Delaware. The Honorable Laurie Selber Silverstein was assigned to the case, which has been designated as case number 18-12635. Completion of the Court-supervised process is expected by early January. David’s Bridal has sufficient liquidity to meet its business obligations and will continue to operate its business as usual throughout the Court-supervised restructuring process. The more than 300 David’s Bridal stores and website will continue to operate without disruption, orders will arrive on time, and bridal appointments will not be impacted. The Debtors filed first day motions requesting interim approval of a $125.0 million DIP ABL facility and a $60.0 million DIP Term Loan Facility. The Company also filed a Plan of Reorganization and a Disclosure Statement, which indicates that claims of general unsecured creditors will be satisfied in full. A hearing on interim approval is expected to occur by November 22, and a hearing to approve the Plan of Reorganization and Disclosure Statement is scheduled to occur by December 28. Management entered into a Restructuring Support Agreement with holders of 85% of the $481.2 million in outstanding Term Loans, holders of 97% of the $270.0 million in Unsecured Notes, and the Debtors’ principal equity holders. The restructuring contemplates a substantial deleveraging that will reduce the Debtors’ funded indebtedness from $776.9 million to $343.0 million (based on currently anticipated borrowings under an exit ABL facility at the effective date, subject to change). As of the Petition Date, the Company’s debt obligations include: (i) $25.7 million in borrowings under the Prepetition ABL Facility; (ii) $481.2 million under the Prepetition Term Loan Agreement; and (iii) $270.0 million under the Unsecured Notes. On November 19, the Court in the Sears Holdings Corporation, DIP case issued a final order authorizing the Debtors to: (i) commence closing sales at 142 stores; and (ii) engage Abacus Advisors Group L.L.C. to conduct the GOB sales. The 142 closing stores are in addition to the previously announced group of 46 unprofitable units which are closing this month. The Company must find a stalking horse bidder by December 15, which would set the floor price for other offers. If there is more than one qualifying bid for the stores, an auction will be held in mid-January. Chairman Edward Lampert’s hedge fund, ESL Investments Inc., is expected to make a stalking horse bid. The Court also authorized bidding procedures for the sale of the Sears Home Improvement Business. An auction will be held on December 13, 2018, and a hearing to approve a sale will be held on December 18, 2018. Meanwhile, Sears filed a term sheet summarizing details of a proposed $350.0 million secured Junior DIP Term Loan Facility to be provided by GACP Finance Co., LLC, a unit of Great American Capital Partners, LLC. The borrowers are Sears Roebuck Acceptance Corp. and Kmart Corporation. A hearing to consider interim approval of the Junior DIP Term loan is scheduled for November 27, 2018. On Monday, the Court also authorized the Debtors to pay up to $90.0 million in prepetition obligations to critical vendors on a final basis, up from $70.0 million on an interim basis. Prepetition accounts payables totaled almost $500.0 million, consequently the amount authorized for critical vendors during bankruptcy proceedings represents a relatively small portion of the balance. The Company said it also received authorization to continue paying employee wages and benefits, and to honor member programs including warranties and promotions. A map of the closures can be seen below. Click here to request a list of the closing locations. German discount grocer Lidl announced it will acquire all 26 of Best Market’s New York locations and its New Jersey location; the Best Market store in Newington, CT, is not part of the deal. The move allows Lidl to expand its regional presence and enter a new market in Long Island. The Company noted the transaction is should be finalized in a few weeks; however financial terms were not disclosed, including any indication on the assumption of Best Market’s debt, liabilities, etc. It is possible that Lidl is acquiring the leases for the impacted stores which is why there has been no reference to the distribution center or HQ. On Monday, SpartanNash announced it has reached an agreement to acquire Martin’s Super Markets, operator of 21 stores in Northern Indiana and Southwest Michigan. For the fiscal year ended July 29, 2018, Martin’s had more than $450.0 million in net sales. Terms of the deal were not disclosed. The transaction is expected to close early in the first quarter of fiscal 2019, subject to customary closing conditions. On Monday, Ahold Delhaize commenced an offer to purchase up to $350.0 million of its 5.7% Senior Notes due 2040 originally issued by Delhaize Group prior to its merger with Ahold in July 2016. In other news, Ahold Delhaize’s CEO Frans Muller said in a recent interview that the Company is looking for acquisitions in the U.S. Mr. Muller commented, “We have a strong market share in regions where we are active. That gives us a good starting point to join in the acquisition game.” There were no details about possible targets or how much the Company might spend on acquisitions. Meanwhile, at its Capital Markets Day event held last week, executives outlined a plan to grow its omnichannel capabilities, primarily through its Peapod Digital Labs and Retail Business Services units in the U.S. Dubbed “Leading Together,” the initiative includes greater investment in technology, notably in artificial intelligence, robotics and tools; it also includes more fresh and healthy foods, meal solutions, and expanded private brand offerings, among other things. The strategy is projected to double online sales Companywide to €7.00 billion (US$7.93 billion) by 2021 and establish more than 600 click-and-collect locations in the U.S. by the end of this year. An estimated 65% of U.S. customers are expected to have same-day or faster online grocery access by 2020. Last week, Starbucks CEO Kevin Johnson said in an internal memo that the Company is planning to cut approximately 5% of its global corporate workforce, impacting about 350 employees in marketing, product, technology and store development. Mr. Johnson said affected divisions are expected to undergo “significant changes.”Meanwhile, Starbucks has apparently removed seven people from its leadership webpage and added five others, and announced that chief procurement officer Chris Carr currently is taking a sabbatical.A Starbucks representative would not confirm any specific departures, but said the executives who were removed from the leadership page were a combination of voluntary and involuntary departures, including sabbaticals and new roles at Nestle through a $7.15 billion deal for the Swiss company to sell Starbucks' products. 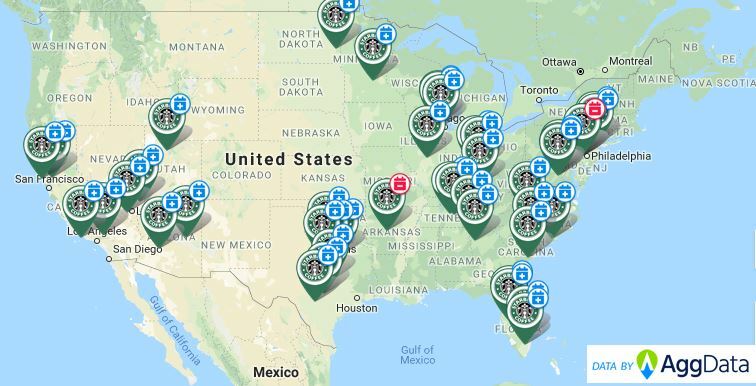 If you're interested in a list of all future opening & closing Starbucks locations, click here. On November 13, the Court issued orders authorizing Mattress Firm to reject unexpired leases on an additional 299 stores. This brings the total of approved lease rejections to 506, which are part of a group of 700 units the Company previously indicated they planned to close. On November 13, Fred’s completed the sale of assets from nine stores to Walgreens Boots Alliance. As previously announced, Walgreens agreed to purchase prescription files and related data and records, retail pharmaceutical inventory, and certain other assets from 179 of Fred’s retail pharmacy stores for $157.0 million plus inventory of up to $35.0 million. Fred’s will continue transferring ownership of the assets to Walgreen in a series of ongoing closings, with the final closing expected in the first quarter of calendar 2019. Proceeds will be used to pay down the Company’s existing debt or for general corporate purposes. According to local reports, Walgreens Boots Alliance has opened a new store in Chicago, without a pharmacy. A sign in the store directs them to a nearby Walgreens with a pharmacy. Management declined to comment why it opened the store without a pharmacy. The Company has only a handful of locations in other markets that don’t sell prescriptions. The Company also announced Kimberly Scardino will resign as Controller and Chief Accounting officer, effective December 21, 2018. CFO James Kehoe will assume her role until a replacement is appointed. City Furniture is investing $100.0 million to expand in Florida. The Company opened the first of three Orlando-area locations, in Ocoee, in an 85,000 square-foot space. City is on track to open two 120,000 square-foot locations next year, one near the Mall of Millennia and the other in Altamonte Springs. The Company is also completing a Central Florida distribution center adjacent to the Ocoee store. City Furniture operates 17 showrooms in Florida, and licenses 12 Ashley HomeStore showrooms. Publix announced that its sixth redesigned organic and natural foods GreenWise store concept will be located in Fort Lauderdale, FL. No opening date has been set. In March 2017, the Company announced plans to “reignite” its GreenWise concept, noting that it does not expect GreenWise to be a primary grocery store for the majority of its customers but rather a 25,000 square foot store for specialty items. GreenWise is also the name of a Publix brand launched in 2003 that includes organic products. 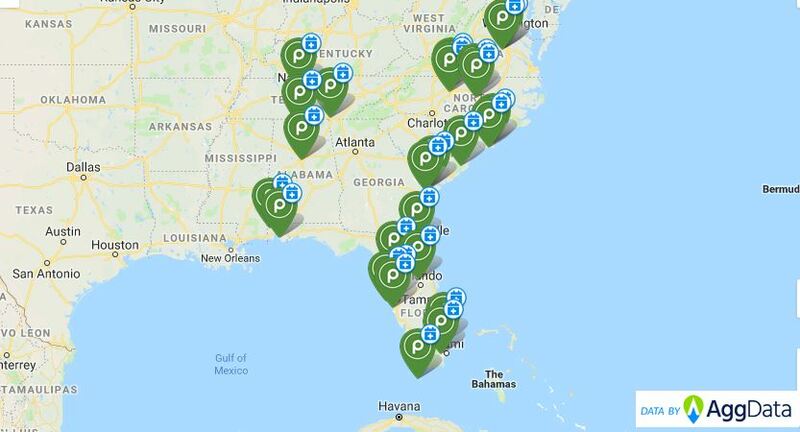 In October 2018, the first newly redesigned GreenWise store opened in Tallahassee, FL, with other stores expected to open in Mount Pleasant, SC (early 2019); Lakeland, FL; Boca Raton, FL; and Marietta, GA - see below for Future Openings Map. The Company also has three first generation GreenWise Market stores in Palm Beach Gardens, Boca Raton and Tampa, FL. If you're interested in a list of all future Publix locations, click here. An independent Piggly Wiggly store-owner, with the support of C&S Wholesale (owner of the Piggly Wiggly brand), opened a new store in St. Mathews, SC, in a former BI-LO. With this additional store, C&S will service 52 Piggly Wiggly locations in South Carolina and Southeast Georgia. 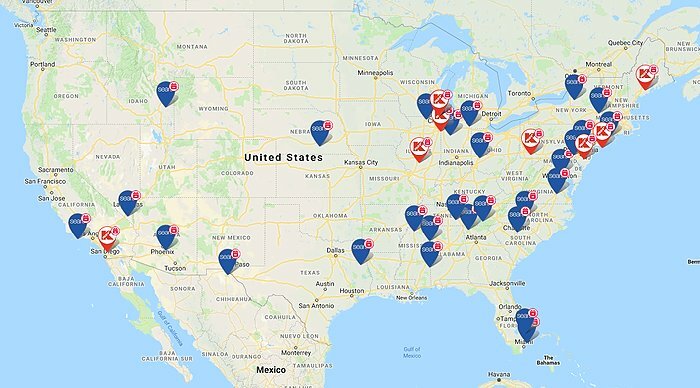 Currently, there are over 600 Piggly Wiggly supermarkets independently owned and operated in several states. On November 14, Arden Group’s Gelson’s opened a new, 30,460 square-foot store in Manhattan Beach, CA. The Company currently operates 37 stores in California. The Giant Eagle store in Richland Township, PA recently debuted an Ace Hardware "store-within-a-store" in a newly remodeled store, one of five of its stores to introduce the concept this fall. The others are located in Pittsburgh's suburbs. According to the Company, if they are successful, the format could be expanded across the multi-state area. Giant Eagle has more than 400 stores throughout western Pennsylvania, north central Ohio, and parts of West Virginia, Maryland and Indiana. Champion Athleticwear, which opened its first-ever U.S. store in April in Los Angeles, most recently opened its fourth location, a 2,800 square-foot unit in Boston. The store includes products only available at that location, along with on-site customization that will feature both Champion and Boston-themed patches. Shoppers can also create their own made-to-order garments through embroidery. The Company’s other two stores are located in New York and Chicago. Nike debuted a 68,000 square-foot store on Manhattan’s Fifth Avenue. The location combines innovative physical services and digital features via the Nike app to provide a personalized and futuristic shopping experience. FAO Schwarz opened its flagship location in Manhattan’s Rockefeller Plaza on November 16, three years after it exited the city. The 20,000 square-foot location features the brand’s signature toys and an array of in-store shops and interactive experiences. The merchandise assortment includes more than 200 FAO Schwarz-branded toys as well as products from over 15 toy brands. iFresh reported second quarter sales fell 9.2% to $30.3 million. Retail sales declined 3.3% to $25.86 million mainly due to its Quincy and Boston, MA stores, which are facing significant competition. Wholesale sales fell 32.8% to $4.43 million, attributable in part to decreases in sales to related parties, as wholesale customers purchased more produce from local farmers. Loss from operations was $4.03 million, compared to $0.85 million last year, and net loss was $4.2 million. iFresh operates nine stores and has three more currently under construction located in Long Island, NY; North Miami, FL; and Milford, CT.
Natural Grocers’ fourth quarter sales increased 9.6% to $217.5 million, primarily driven by comp growth of 6.3% and a $6.4 million increase in new store sales. Comp growth reflects a 3.8% increase in average transaction count and a 2.5% increase in average transaction size. Operating income was $3.46 million, compared to $2.74 million last year, and net income rose 68.7% to $2.1 million. During fiscal 2018, the Company opened eight new stores and relocated three, compared to opening 14 new stores and relocating two in fiscal 2017. Since the end of the fourth quarter, the Company has opened two new stores, relocated one store and closed one store. In addition, it has five signed leases for new stores in Colorado, North Dakota, Oregon, and Texas that are planned to open during fiscal 2019 and beyond. Looking ahead at fiscal 2019, the Company expects comp growth of 2% – 4%. Capital expenditures are expected to be $27.0 million – $32.0 million; it will open 7 – 9 new stores and complete 5 – 6 relocations. Smart & Final reported third quarter sales growth of 2.8% to $1.50 billion, driven by 0.6% comp growth and new store growth. Comp growth was comprised of a 1.9% increase in average transaction size, partially offset by a 1.3% decrease in transaction count. The Company estimates that the year-to-year deflation rate in product pricing was -0.7%. Sales increased 2.5% to $1.14 billion at its Smart & Final banner, and rose 3.3% to $353.6 million at its Smart Foodservice Warehouse banner. Net income was $10.2 million compared to $5.1 million last year, benefiting from U.S. tax reform. During the quarter, the Company opened three new Smart & Final Extra! stores, relocated one legacy Smart & Final store to an Extra! format store and closed one legacy Smart & Final store. As of October 7, the Company operated 324 stores. Looking ahead at fiscal 2018, the Company revised its guidance and now expects sales growth of 3.5% – 3.75%, down from previous guidance of 4% – 5%; comp growth of 1% – 1.25%, revised from 1% – 2%; and adjusted EBITDA of $180.0 million – $185.0 million, compared to $180.0 million – $190.0 million. It will open a total of four Smart & Final Extra! stores and three Smart Foodservice Warehouse stores, down from previous guidance of five Extra! stores and 4 Warehouse stores. During a conference call to discuss results, CEO David Hirz stated that e-commerce sales for the quarter doubled for the Smart & Final banner and surged 500% for the Smart Foodservice stores. The Company is investing in both delivery and pickup offerings, which helped drive results. It recently added a second delivery pilot for its Smart Foodservice banner in the Portland, OR market to serve small business and restaurant customers within a 50-mile radius. Walmart’s third quarter sales increased 1.4% to $124.90 billion. Comps, excluding fuel, increased 3.4% in the U.S. E-commerce sales soared 43%, topping the 40% growth in the previous quarter, and on track for e-commerce sales to rise by 40% this year. The Company has expanded its grocery pickup program (grocery sales make up 56% of Walmart’s revenue), which allows customers to order online and pickup at 2,100 of its U.S. stores. Walmart will also add grocery delivery services to about 800 stores by the end of the year. Sales at Walmart International were $28.80 billion, a decline of 2.6%, with comp sales positive in nine of 10 markets. Sam's Club comp sales increased 3.2%, with e-commerce sales up 32%. Net income fell 2.2% to $1.71 billion. Margins were impacted as the Company absorbed higher transportation costs and invested heavily in its online business. Walmart raised its full year outlook and now expects fiscal 2019 adjusted EPS of $4.75 – $4.85, up from $4.65 – $4.80. Comps, excluding fuel, are expected to grow “at least” 3%, a change from “about” 3% earlier in fiscal 2019. Target’s third quarter revenue increased 5.6% to $17.82 billion, driven by comp growth of 5.1% and a 0.6% contribution from non-mature stores. Comparable digital channel sales rose 49% and contributed 1.9% of comp growth. Operating income was $819.0 million, down 3.3% from $847.0 million last year. Margins were negatively impacted by higher supply chain costs driven by growth in digital fulfillment costs and other expenses related to the size and timing of holiday-related inventory receipts compared with last year, partially offset by the benefit of merchant initiatives. Looking ahead at the full year, Target continues to expect adjusted EPS of $5.41 – $5.60 (adjusted EPS of $5.30 – $5.50). For the fourth quarter, it expects comp growth of 5%. TJX reported third quarter sales growth of 12.1% to $9.83 billion, driven by comp growth of 7%. Comps increased 9% at Marmaxx, 7% at HomeGoods, 5% at TJX Canada and 3% at TJX International (Europe & Australia). Net income increased 18.8% to $762.3 million, positively impacted by U.S. tax reform. Growth was partially offset by a $36.0 million pension settlement charge. During the third quarter, the Company increased its store count by 102 stores to a total of 4,296 stores, resulting in 4% square footage growth. Looking ahead at fiscal 2019, TJX expects EPS of $2.41 – $2.43, with incremental freight costs and wage increases negatively impacting EPS growth by 5%. This would represent an 8% increase over the prior year’s adjusted earnings per share of $1.93. Comps are expected to increase 5% on a consolidated basis and 6% at Marmaxx. Nordstrom’s third quarter sales increased 3% to $3.65 billion, and comps were up 2.3%. Full-price comps increased 0.4%, and off-price comps increased 5.8%. Gross margin decreased 137 basis points to 33.3%, and SG&A expenses increased 188 basis points. EBIT declined 49.5% to $105.0 million, negatively impacted by a non-recurring estimated credit-related charge of $72.0 million. This estimated charge resulted from some delinquent Nordstrom credit card accounts being charged higher interest in error. The Company has taken action to address this issue and estimates that less than 4% of Nordstrom cardholders will receive a cash refund or credit to outstanding balances. To date in fiscal 2018, the Company opened 16 stores, closed two underperforming locations, and relocated one existing store. Dillard’s third quarter sales increased 4.7% to $1.42 billion, and comps were up 3%. Total merchandise sales increased 2% to $1.34 billion. Above-trend performances were noted in ladies accessories and lingerie followed by juniors and children’s apparel. Sales were slightly above trend in men’s apparel and accessories and home and furniture. Sales were consistent with trend in shoes, slightly below trend in ladies apparel and cosmetics. Gross margin from retail operations declined 87 basis points due to increased markdowns, and SG&A expenses rose due to increased payroll expense, primarily selling payroll. Profit fell 49% to $7.4 million; included in the prior-year profit is a pretax gain on disposal of assets of $4.8 million. At November 3, the Company operated 265 Dillard’s locations and 27 clearance centers. Modell’s Sporting Goods reported third quarter comps increased 3%, the fourth consecutive period of positive comps. Year-to-date comps were up 3.5%. Top-performing categories included licensed and apparel (especially fleece and workwear). The Company is in the process of enhancing its footwear and sporting goods merchandise mix. Year-to-date gross margin improved 160 basis points over the same period last year. Management anticipates tougher comp and gross margin comparisons during the 2018 fourth quarter due to last year’s strong sales of apparel and Eagles’ merchandise, much of which was at full price. A contract was executed, and closing is scheduled for December, as part of a financing transaction on the Company’s distribution center in the Bronx. The agreement gives Modell’s lease-back rights. An entity controlled by the Modell family owns the distribution center and will receive the proceeds. Management said it does not expect any near-term impact from the transaction. The Company operated 155 stores and its e-commerce business at the end of October. Modell’s opened its second new store of the year on November 15 in Media, PA and anticipates closing up to five stores in the coming year. Looking ahead, Best Buy expects fourth quarter revenue of $14.40 billion – $14.80 billion on comps of 0% – 3%, and FY19 revenue of $42.50 billion – $42.90 billion on comps of 4% – 5%. Lowe’s third quarter sales increased 3.8% to $17.40 billion, and comparable sales were up 1.5%; comps for its U.S. home improvement business rose 2%. Management has substantially completed its strategic reassessment of the business and identified actions to drive focus on its core home improvement business and improve profitability. The Company intends to exit its Mexico retail operations and is exploring strategic alternatives. Lowe’s has also identified certain non-core activities within its U.S. home improvement business to exit, including Alacrity Renovation Services and Iris Smart Home. These actions are in addition to the previously announced decisions to exit its Orchard Supply Hardware operations and close 20 underperforming stores in the U.S. and 31 stores and other locations in Canada. 3Q18 results include $280.0 million in pre-tax charges related to the decisions to close all Orchard Supply Hardware locations, to close certain underperforming stores in the U.S. and Canada and other locations in Canada, to exit retail operations in Mexico, and to exit certain non-core activities, including Alacrity and Iris. Additional pre-tax charges of $460.0 million to $580.0 million related to these decisions and consisting of lease obligations, accelerated depreciation and amortization, severance and other costs are expected to be incurred in 4Q18. CEO Marvin Ellison commented, “During the quarter, the favorable macroeconomic environment, combined with great values, drove traffic to our stores and website. However, continued challenges with inventory out of stocks, poor reset execution, and assortment concerns in certain categories pressured our ability to turn those visits into transactions. Rather than chase short-term solutions to these problems, we are redesigning processes and systems to deliver sustainable improvement, and expect to see positive trends as we enter 2019.” As of November 2, Lowe’s operated 2,133 stores in the U.S., Canada and Mexico. Looking ahead to fiscal 2018, the Company expects total sales to increase approximately 4%, and comparable sales to increase approximately 2.5%. Shoe Carnival’s third quarter sales decreased 6.4% to $269.2 million, which the Company attributed to the calendar shift (fiscal 2017 was a 53-week year compared to 52 weeks in fiscal 2018). Approximately $25.1 million of sales in 3Q17 shifted to 2Q18. Comps were up 4.5%. Gross margin improved to 30.2% from 29.8%, merchandise margin increased 1.1%, and SG&A expenses decreased due to lower advertising expense, expense reductions from closed stores, and a gain on insurance proceeds related to stores affected by recent hurricanes; this was partially offset by an increase in incentive and equity compensation expense as a result of the Company’s improved financial performance. Operating income declined 10.4% to $16.0 million. The Company opened three stores and closed nine underperforming locations during the first nine months. Shoe Carnival plans to close another five stores during the fourth quarter. Looking ahead, the Company expects fourth quarter EPS of $1.90 to $2.10 and increased its full-year adjusted EPS guidance to $2.60 to $2.80, from $2.45 to $2.70 previously. L Brands’ board also announced it reduced its annual ordinary dividend to $1.20 from $2.40 currently, beginning with the quarterly dividend to be paid in March 2019. The reduction will result in a dividend payout ratio that is more consistent with past practice. The approximately $325.0 million in cash made available from the dividend reduction will be utilized primarily to contribute to the deleveraging of the Company’s balance sheet over time. Finally, L Brands announced that John Mehas has been named CEO of Victoria’s Secret Lingerie, effective early 2019, replacing Jan Singer, who has resigned. Mr. Mehas is currently serving as president of lifestyle brand Tory Burch and previously led Club Monaco, a Polo Ralph Lauren brand, for 13 years as president and CEO. Urban Outfitters announced third quarter sales increased 9% to a record $973.5 million, while comparable retail segment net sales increased 8%, driven by strong double-digit growth in the digital channel and positive retail store sales. By brand, comps jumped 12% at Free People, 8% at Anthropologie and 7% at Urban Outfitters. Wholesale segment net sales increased 12%. During the nine months ended October 31, the Company opened a total of 14 new locations including: 4 Anthropologie Group stores, 4 Urban Outfitters stores, 3 Free People stores and 3 Food and Beverage restaurants; it closed 4 locations including: 2 Anthropologie Group stores, 1 Urban Outfitters store and 1 Free People store. During the nine months, 3 franchisee-owned Urban Outfitters stores were opened. Williams-Sonoma’s third quarter sales increased 4.4% to $1.36 billion, with retail sales increasing 0.2% to $610.0 million; e-commerce revenue jumped 8.2% to $747.0 million, accelerating to 55% of total sales from 53.1% last year. Total comparable sales rose 3.1%. By segment, comps were up 8.3% at West Elm, 2.1% at Williams-Sonoma, 1.4% at Pottery Barn, and flat at Pottery Barn Kids and Teen. Gross margin improved to 36.5% from 35.9%, but SG&A expenses rose 12.6% to $401.0 million. As a result, operating income fell 14.8% to $94.4 million. For fiscal 2018, the Company plans to open 22 new stores and close 33 underperforming locations, ending the year with 620 stores. Cineplex’s third quarter sales increased 4.4% to $386.7 million. Theatre attendance was up 2.6% to 17.2 million. Box office revenues per patron rose 2.7% to $10.07, and concession revenues per patron were up 4% to $6.25. Adjusted EBITDA declined 9.2% to $53.4 million, primarily due to an $8.4 million increase in share-based compensation expenses and $1.0 million in restructuring charges, in addition to a decline in media revenue. During the quarter the Company opened two new theatres and announced plans to roll out additional 4DX locations across Canada. On November 13, Cineplex entered into amended and extended credit facilities, including an increased and extended five-year term revolving component, an extended seven year non-revolving component, and additional flexibility in the permitted use of funds. The amended facilities total $800.0 million comprised of a $150.0 million seven-year senior secured non-revolving term credit facility and a $650.0 million five-year senior secured revolving credit facility. Separately, Cineplex declared a cash dividend of $0.145 per share for the month of November, representing a total consideration of $9.2 million, payable on December 31 to shareholders of record on November 30.